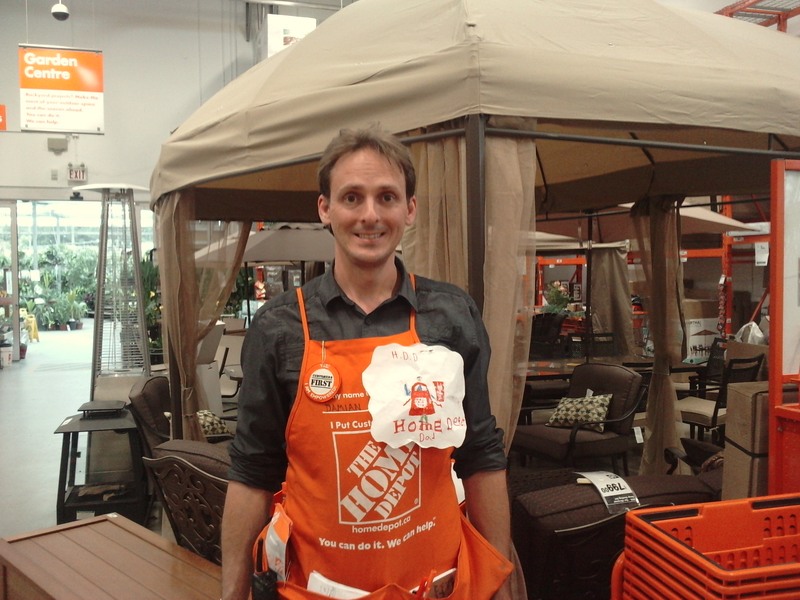 This looks familiar….. | Damian Trasler's Secret Blog - Do Not Read! Well, the picture won’t look familiar. 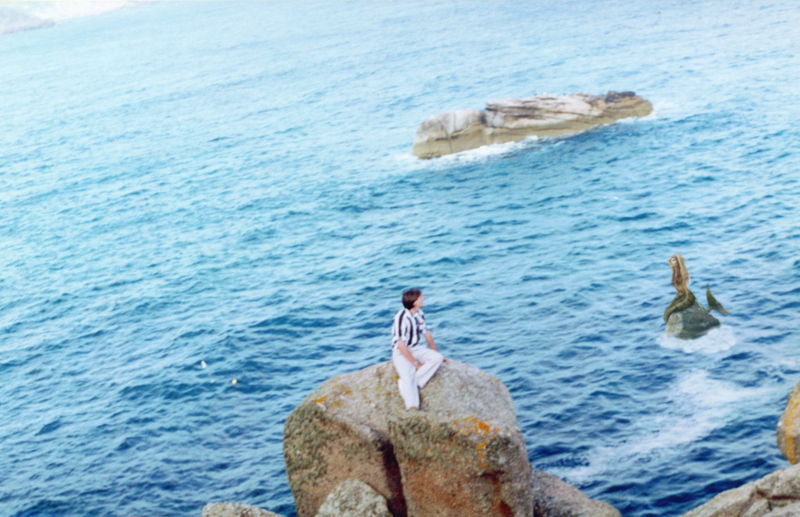 That’s me, on a rock at Land’s End, more years ago than I care to think about. I’m the one in the stripey shirt. I was looking for a picture to illustrate the post and this one was the closest I could find without riping someone off, copyright-wise, or going out and taking a picture. I only have half an hour, so that wasn’t an option. This looks familiar, because there have been many times in my life where I’ve been at this point: On the edge, about to dive in. It’s the day before I start a new job. Some people may think that DamnNearlyForty is a stupid age to be getting a new job. They’d be right. They’d also have thought that having a job which involves saying “Hello” to people as they enter a store while wearing a brightly coloured apron with my name on it was demeaning. I won’t comment on that. There are many ideas about what you should do before starting a new job. I’m horribly aware that I am doing NONE OF THEM! I haven’t researched my new company on the internet. I haven’t googled my new manager to see if he’s on Facebook (Or the FBI’s 10 Most Wanted). I haven’t planned my ensemble for the morning to make sure my shoes don’t clash with my tie. I haven’t even assembled some family photographs, holiday keepsakes and a fluffy toy to decorate my desk. Yes, there are many ways to go into a new job, but I’ve never heard anyone recommend ‘Half-arsed” as a good method. Still, that’s the one I’m going with. There is a difference between this job and the others I’ve taken in the past. For one thing, this job is a step up from the one I’ve been doing (No disrespect to The World’s Largest Home Improvement Retailer, but this actually requires a skillset beyond smiling and remaining chipper despite an eight hour shift…) I haven’t moved up a grade of work since my days in the Civil Service. *Question: How many people work in the Civil Service? I wasn’t promoted on merit back then, it was just that a permanent job came about for my grade, and I moved up from temporary to permanent status. Good, but not the same. In this case, I took the first job I could to help the family with mortgages and bills, and now I’ve found a better paid job with fewer expenses, and as a bonus it requires me to do something I’m quite good at: proofreading. The big question is, what happens with the writing? In my previous working life, I had days off during the week. Once the Weasels were in school, I was at leisure to knock out the odd sketch, or a play, or a panto. With my new job, I’m in the office Monday to Friday, 9-1. That does leave about an hour a day before I have to collect weasels, but will I use it wisely? Given that I’ve spent most of today surfing the net, laughing at other people’s blogs and watching YouTube, I have my doubts. What’s been YOUR weirdest employment experience? Do you write more when you have a day job, or less? Have you ever worn an apron to work? Was it on purpose? In the days before I took up working for a living, I wrote an e-book on writing plays, called “Writing a play for Community Theatre” and you can download it from www.tlc-creative.co.uk . If 25,000 people do that each year, I won’t have to go to work at all. There’s a nice thought. This entry was posted in Writing and tagged Damian Trasler, googling my manager, new job, playwright, starting a new job, writing. Bookmark the permalink. I think the job I have right now is my weirdest, and it’s in a library! A library across the street from a middle school and an elementary school. So the first part of the day is dealing with people who aren’t working and either are trying to work or trying to beat the dealer in online poker. The second part is spent with pre-pubescent spazzes (sp?) and people still trying to beat the dealer in online poker…yet it’s the best damn job I’ve ever had. Sooo jealous! I’ve never managed to get a job in a proper library. The only time I managed to get as far as an interview, I made the mistake of mentioning that we had applied to emigrate, which dented my chances of long-term employment. D’oh! Surfing the net, reading blogs and watching YouTube? Is there another opening where you work? Lol. But seriously, it might take you a week or two to adjust but you’ll get into the rhythm and before you know it you’ll have a new writing schedule. Good luck! How’s the new job, D? My weird jobs – I was an usher at a minor league baseball stadium. I wiped off the “rich” people’s seats. Then I moved on to beverage cart girl at a local country club. I actually loved that job – great tips, great references, and I got to meet Matthew McConnoughy. I’m not working now, and that might have to change in the very near future. I’m writing as much as possible now just in case. I used to have a Corporate America job and I never got any writing done. Well done, sir! You’ve had a fun ride in the working world, right?